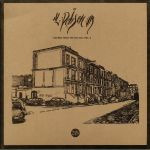 Review: Before finding fame as part of the extended Rhythm Section International family, Peckham beat-maker Al Dobson Jr. caught listeners' attention via the IZWID released "Sounds From The Village Volume One". Five years on, he's finally produced a sequel. Like its' predecessor, "Volume 2" contains a dizzying number of short-but-sweet workouts that mix-and-match elements of blazed instrumental hip-hop, tropical drum music, bass-heavy electronica, jaunty jazz-funk, dusty jazz, dub riddims, spaced-out soundscapes and almost Balearic musical positivity. With short tracks coming and going at a furious pace, it's sometimes hard to keep up with Dobson's imagination let alone what's coming out of the speakers. That, though, is undeniably a good thing, because "Sounds From The Village Volume 2" sparkles from start to finish.